The key to having a good camping experience is being comfortable. 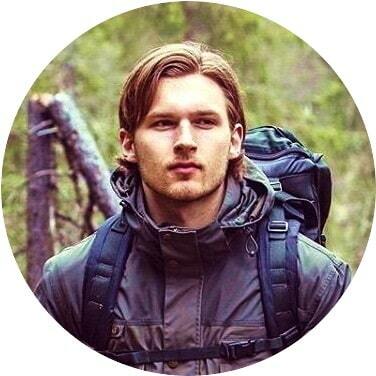 Many people decide to take camping trips during the summer when the weather is best, but without air conditioning, it can start to become stifling really quickly, especially when you’ve been setting up your gear or hiking all day. But you can change all that by having the best camping cooler with you to keep your drinks cold, as well as packing a few ingredients and meals that you can heat up quickly. Not all coolers are built the same, so knowing what to buy can really help you beat the heat and keep your food lasting longer. Before buying one, however, you should really ask yourself the question: do you really need a cooler in the first place. Unless you’re planning on eating all of your meal at each sitting, then you’re not likely to need one. You might be better off with a smaller soft cooler that can handle keeping your drinks cold and is easier to pack away. But if you’re planning to stay out for longer periods of time, a larger, hard cooler would be more suitable for your needs. 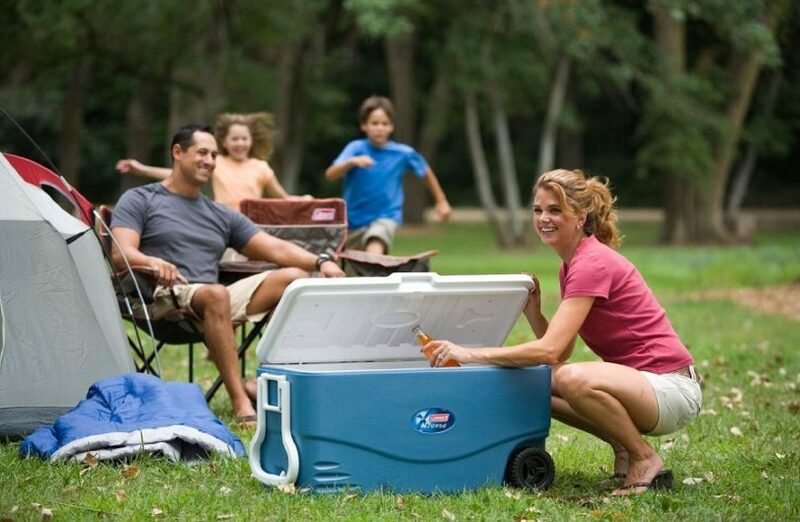 You probably didn’t know that there are several different kinds of coolers to choose from in order to make your camping experience more enjoyable. They all serve different purposes and are capable of fulfilling all of your cooling needs, no matter what they may be. Traditional: you’ve probably seen these in your local grocery or convenience store when summer time hits. These are fitted with foam insulation that is trapped between plastic shells glued together. The lids can be hinged or removed altogether, depending on how it’s been constructed. These tend to be at the cheaper end of coolers, because they are so versatile. On a good day, these models are capable of keeping food for at least five days, and are capable of holding up against rigorous treatment, even in the wild. 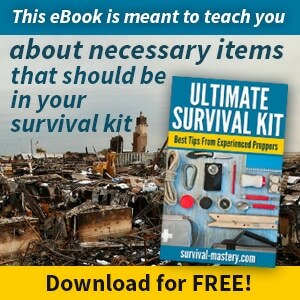 These are the most popular choice for both beginner and experienced campers alike. High End: if price isn’t your main concern, then you may want to invest in a high-end cooler that can outperform the more traditional models. What makes these different from the rest is that they use a rotomolding process that creates a single plastic shell that is injected with insulating foam. This not only makes the cooler more durable, but they can also stay colder for a lot longer. The walls are much thicker, and the lids use rubber gasket seals in order to maximize the insulating properties of this kind of cooler. However, because of this design, the interior tends to be a little bit smaller, so you shouldn’t plan to bring a ton of food with you on your trip. On the other hand, they can keep food colder for longer than six days, so you don’t have to worry about finishing all your meals before your food starts to spoil. Electric: there are only a few electric models available on the market, but they could be exactly what you’re looking for. Many of these can run off of a cigarette lighter in your car, and they don’t require you to lug around any bags of ice or ice packs in order to keep your food cold. These are best for those really long road trips or camping trips where you don’t play on making a lot of stops or purchases along the way. Soft: these take up much less space, but aren’t very large. They’re easy to sling over a shoulder, and once they’re empty, they can fold right up and fit inside another bag. They’re best for small trips, such as to the beach or a picnic, and work best for storing cold drinks. In fact, when looking into these, you’ll likely see manufacturers bragging about how many cans of soda one of these can hold. 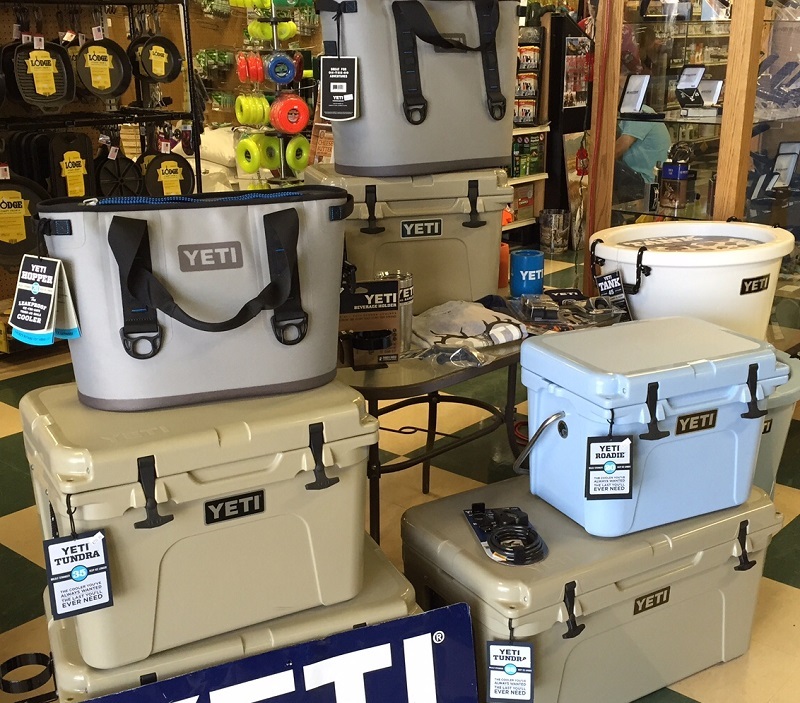 Now that you know of the different varieties of coolers that are in the market, there are some key features that you should look for when comparing and contrasting the ones you’re interested in buying. 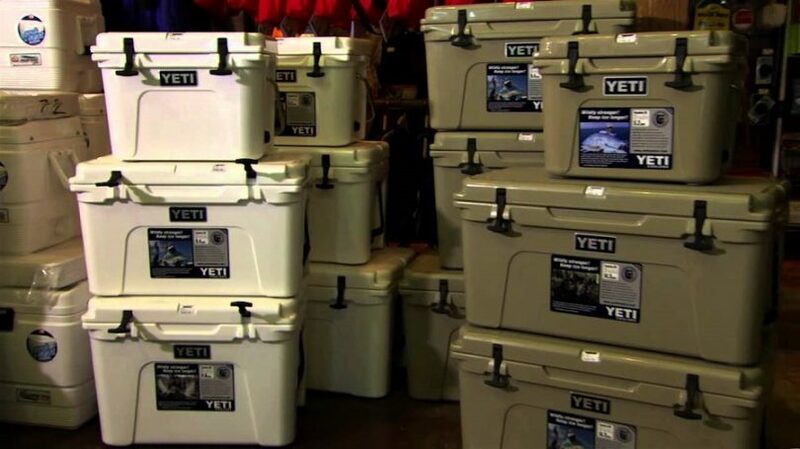 This is the biggest factor when it comes to choosing the best cooler for camping. It’s a general rule that the more food you put into your container, the longer your ice will last so it’s better to have a fully stocked cooler than an empty one. What you’re bringing with you on your trip and how long you plan on being away are the main things to consider when determine the insulating power that you’ll need. 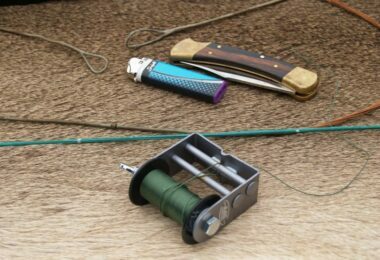 If you plan on fishing or hunting, then a high-end model would serve better for your needs, as the meat you have tends to be warmer than the cooler itself and will cause most of the ice to melt. A high-end model will keep the meat for a lot longer so that you can either bring them back home still intact, or have them ready for when you want to roast them over an open flame. Another benefit to a high-end model of cooler is that they’re capable of handling dry ice. 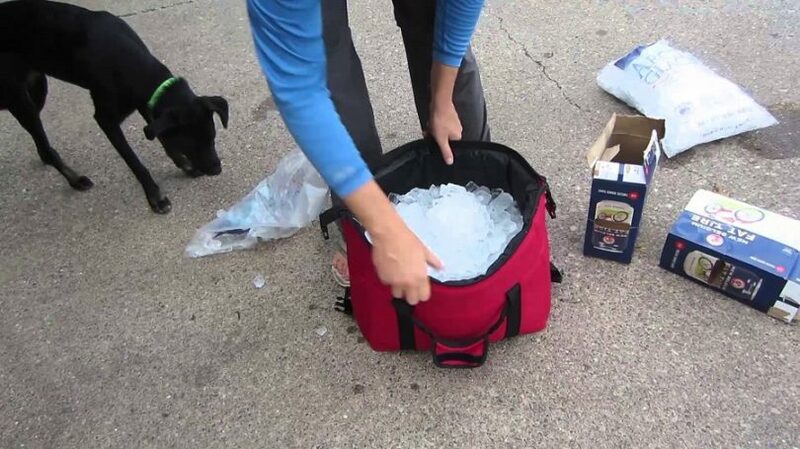 Dry ice can reach temperatures of -109 degrees Fahrenheit, turning your cooler into a veritable portable freezer. This is great for keeping your meats extremely cold, but can cause an incredible amount of stress on the structural integrity of traditional coolers. Traditional models tend to stay below 40 degrees Fahrenheit for at least two to three days before the ice needs to be replaced. You could always purchase a new bag of ice (or several) on the way to your camping site if you’re not interested in investing in a high-end model. Durability is all dependent on how often you plan on going camping each year. 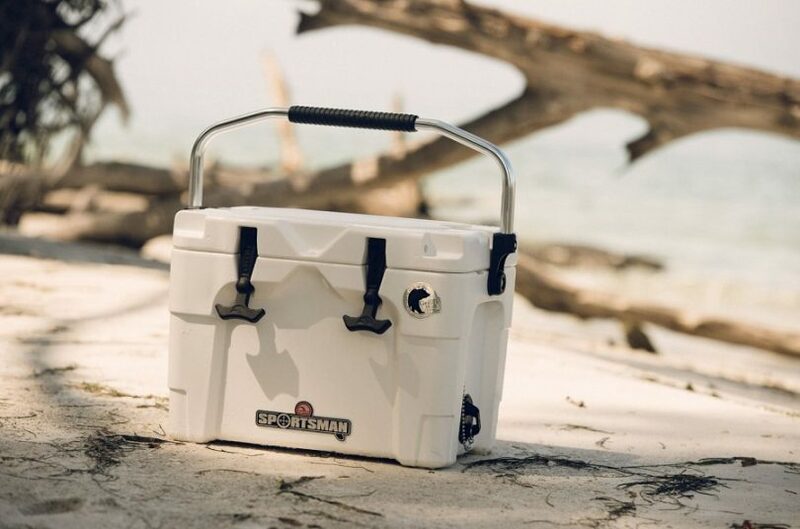 If you only go for a week or two during the summer time, then a traditional cooler would likely be your style, as it’s inexpensive and can withstand a few bumps and bruises along the way. But if you plan on going for extended periods of time several times a year, a traditional cooler just isn’t going to cut it. Although a high-end model may have less space in the interior, they won’t break so easily, no matter how many times you drop it or push it around. They were designed to withstand a lot of punishment, and your camping trips will definitely put these through their paces. They do cost a lot more, but will be worth their price tag instead of having to replace cooler after cooler throughout the year. Once you’ve figured out the previous features, it’s time to look at what size you’d be interested in carrying with you. Larger storage capacity will help you hold more food, but that means buying a lot more ice in order to prevent your food from spoiling. Coolers come in quart sizes, with the most popular size being around 70 quarts. These are more versatile and are capable of keeping food and serving a family over a period of a few days, or for a hunter looking to transport a large amount of meat. Cooler models that are about 25 quarts are perfect for carrying drinks for a few people without taking up a lot of space, or food for a person seeking to camp alone overnight. Internal storage is also good, but the overall size of your cooler is also important to consider. If you’re going to be backpacking or hiking during your trip, carrying around a huge cooler is going to hinder rather than help. 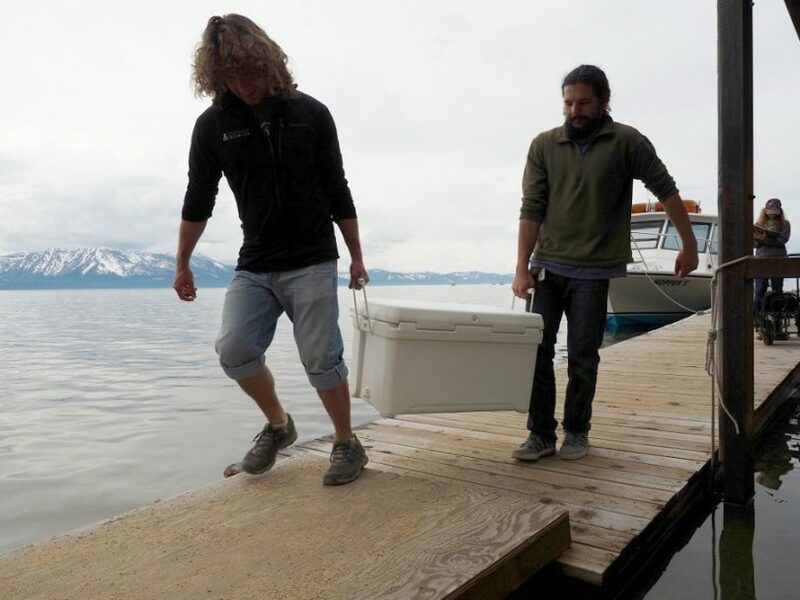 Finding a balance will help you to keep enough food while not having to struggle with finding somewhere to store your cooler and being able to carry it easily to and from your campsite. Anything that’s too difficult for two people to carry is generally too big of a cooler. 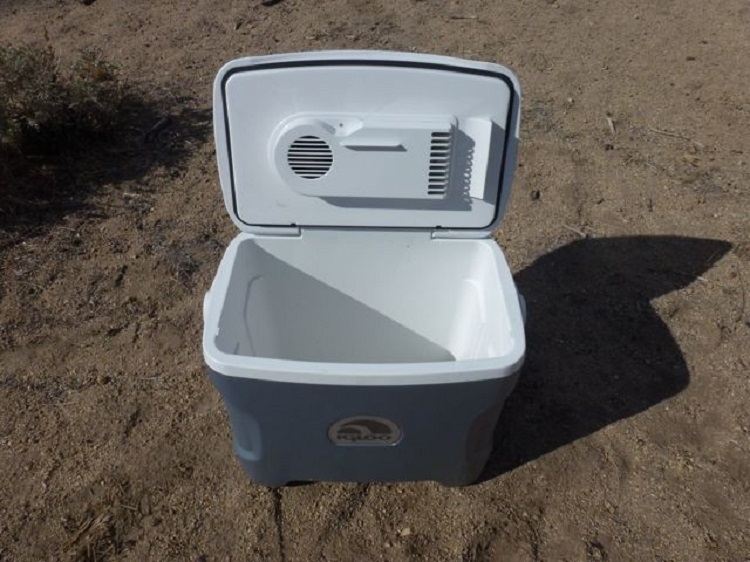 If your park provides bear boxes, you may want to choose coolers that are easier to fit inside; some high-end coolers are actually considered bear boxes in and of themselves because of how they have been constructed. Keep in mind that size and insulation performance go somewhat hand in hand: a smaller design will not hold ice for as long as a larger model, and although it will take a longer time for the cooler to make everything cold, having it packed is more efficient than having your unit cooling empty air. 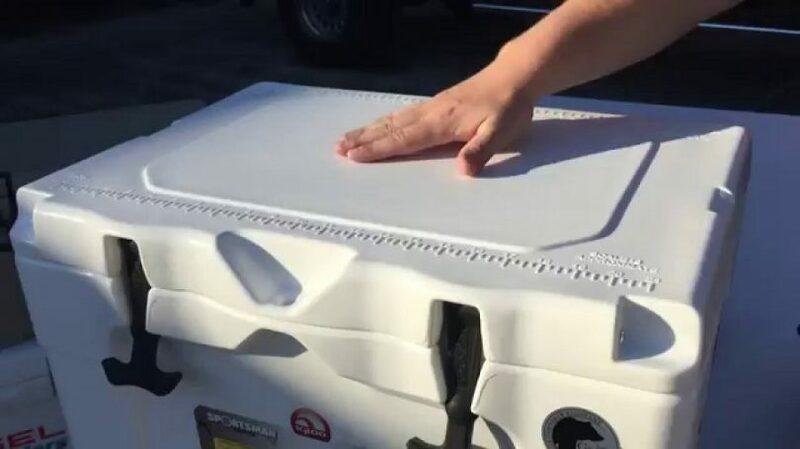 Fully load your cooler at the beginning of your trip in order to maximize on your cooler’s efficiency. Many traditional and high-end coolers are capable of being carried by one or two persons, with specially designed handles to accommodate the various ways it can be carried. Having a fully loaded cooler, on the other hand, may be more than one person can deal with, especially if they’re camping alone. Keep this in mind if you consider buying a larger model. However, if you don’t plan on moving around a lot, you can plan for your cooler to remain in one place during your trip so that you’ll never have to worry about moving it until you’re ready to leave. See our guide on must-have camping gear to help you. But many of the big coolers come with wheels, so you can lug it around by the handle like you’re carrying luggage at the airport. Be sure that the wheels themselves are capable of traversing across rough terrain, because it’s not going to be the same as using them over a smooth floor. The worst case scenario is that a wheel breaks and you’re stuck lugging a heavy cooler to or from your vehicle. That’s the best way to get an aching back and a ruined vacation. 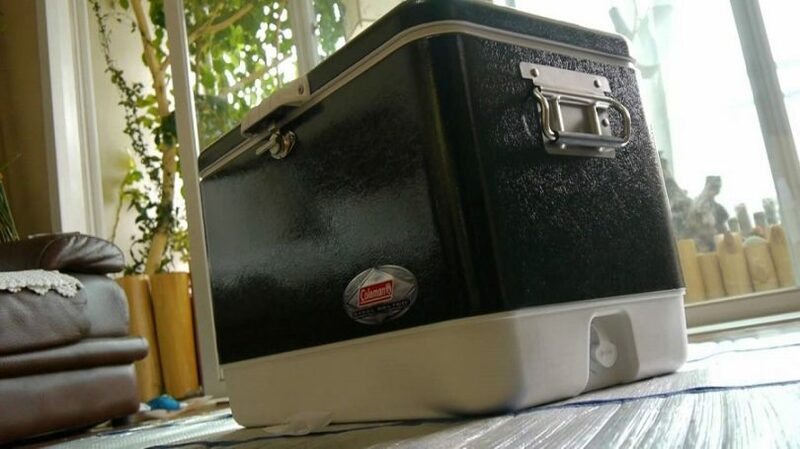 When it comes to how useful your cooler will be for your needs, there are two main features to consider: how easy it is to drain your cooler, and how well can you get to the food that you want. Once your ice has melted, you don’t want to have to unpack all of your food and upturn your cooler in order to get the water out. Instead, an efficient cooler will have a drain to allow runoff so that you can put more ice on top of your food and drinks. The process itself can be quick and simple, or a terrible mess, depending on how your cooler has been constructed. Some coolers have drainage that requires you to elevate one end in order to get all of the water out, which minimizes the strain on your already tired muscles. Other coolers have their drains higher up on the body of the cooler, requiring more manual effort in order to drain completely. Coolers with large drainage holes can empty quite quickly, but you can end up losing some ice cubes in the process if you aren’t eager to use your hand to prevent loss. Another thing to keep in mind is that the water has to go somewhere. It can be impressive to watch the water drain away from your cooler, almost like an artistic fountain, but this can produce a large splash range that can result in many of your belongings getting wet. It’s fine if you’re draining in the great outdoors, where the trees are probably thankful for the extra hydration, but draining from the trunk of your car can be a bigger problem, and you may end up with a soaked trunk. Many models have combat with problem by creating a drain that is hose compatible, allowing you to drain more easily without the risk of splash. However, this only works before water has been created at the bottom of your cooler, as taking out the plug to attach the hose defeats the point of reducing splash. High-end coolers tend to use rubber gaskets around the drain hole as well, which prevents any leakage from taking place. But this means that you won’t be able to open the cooler until all of the water has been drained, and that can take some time to get it completely dry. When you’re eager to get a cold refreshing drink, you don’t want to have to struggle to get your cooler open. The design of the latch is what determines how easy it is to open your cooler, and could be a benefit or a hindrance. Traditional models use an internal latching system while, works efficiently, makes it difficult to open when the cooler is empty, as there is no counterweight to make the top open easier. High-end models tend to use an external latch that all vary, but don’t really outdo each other in any way. What you choose is mostly preferential. Extra features are what can make or break a deal, depending on the person doing the buying. You don’t want a cooler that has so many fancy bits and bobs that you’ll never use them all, but having a few extra handy additions can make your camping experience all the more enjoyable. These are more of a personal preference for your own needs rather than a difficult choice. Some coolers have rulers etched into the lids so you can compare the sizes of your catch with your friends, while others have cup holders so you won’t have to worry about them falling and spilling over. 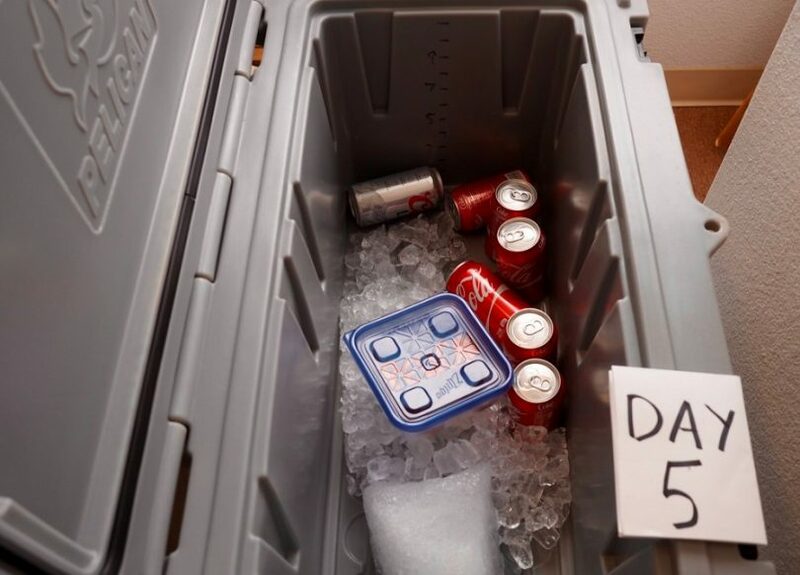 You could get a cooler with a wire basket that keeps certain foods out of the ice and water, while some have a lanyard on the drain plug so that you won’t lose them. The features you go for should be conducive to your needs, as well as be a fun addition during your camping trip. Unfortunately, there isn’t one super cooler that is capable of doing everything that you need and still be comfortable. Large coolers are going to be heavy to carry, but will keep your food for the better part of a week. It’s all about checks and balances to see which one you’d be most comfortable bringing with you on your trip, while enjoying all it has to offer. For a soft cooler, this one was designed to be tough, using a nylon exterior to hold the whole thing together, as well as to withstand the elements of the rugged outdoors. It comes in five colors (black, green, white, blue and red), and two camouflage prints, and also sports dimensions 18-Inch L x 10-Inch W x 12-Inch H.
It’s leak proof and sweat proof, and also comes in a variety of sizes, from 6-pack to 48-pack. The high density open cell foam is designed to keep your drinks and small articles of food cold, and the entire thing packs away nicely when it’s not in use. You can have your choice from seven fantastic colors (black, green, stainless, silver, red/black, red/white and turquoise) and they’ll all keep your drinks and food as cold as the second you put them in. It can hold up to at least 85 cans, so you know you have a lot of room to work with. It’s rust proof, and has a leak-resistant drain that doesn’t require any tilting whatsoever. That means that you can save your back muscles on getting your cooler dry. The solid steel latch allows you to keep your belongings secure, and can endure up to ten pounds of pressure. It has an old-style look to it that many people will love. 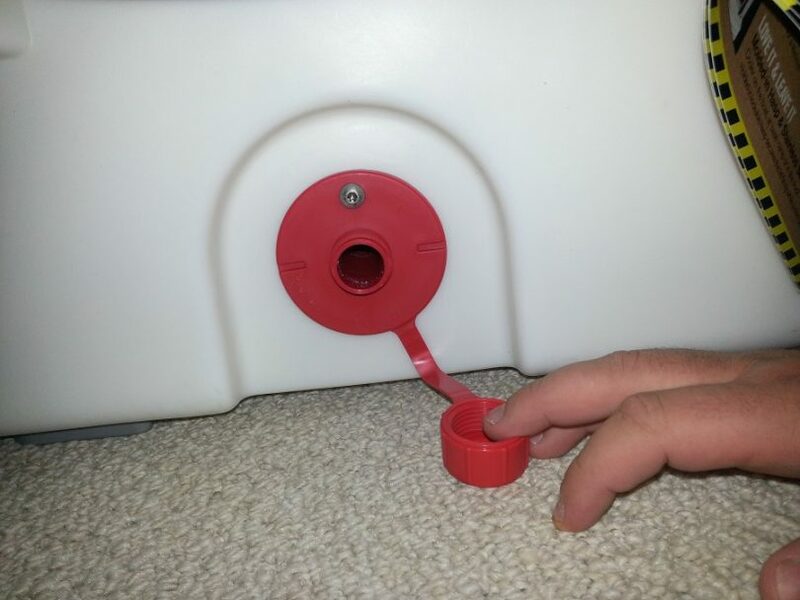 However, there have been some complaints that the lid doesn’t hold up as well as it should, and that the locking mechanism pops open even when tipped over. If you’re interested in electric coolers, then this is one for you. The Igloo Iceless Thermoelectric Cooler is 28 quarts and can take care of all your cooling needs, especially with its 8-foot long electric cord. It plugs into any cigarette lighter, so you can keep it going with any vehicle you’ve taken to your camping site. The quiet motor won’t disturb you even when you’re asleep, and the curved back makes it easy to carry against your side. Many customers have recommended having the cooler running before you add your food, as it does take some time for it to bring the temperature down. Another alternative is to have your food already chilled in your fridge before adding to the cooler, and it is guaranteed to keep them cold. This 52 quart cooler is designed to hold a lot, for an affordable price. This traditional cooler comes in a cool hunter green color, and even comes with a fish measuring ruler on the lid so you can exercise your bragging rights to the rest of your friends. 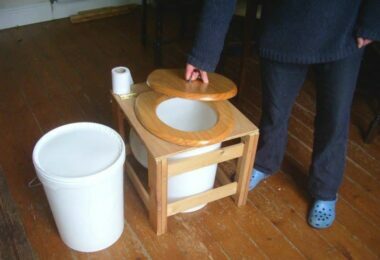 The lid can support up to 300 pounds if you’re interested in using it as a seat, and has a recessed drain so you won’t accidentally knock the plug out when you pass by. 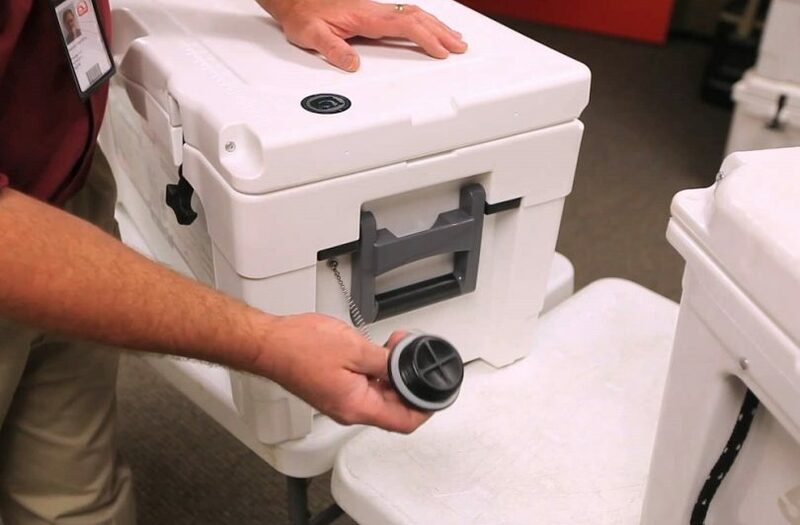 There have been some complaints on the hinges being made from flimsy plastic, causing the lid to fall off after enough use, so you may want to use this cooler with a greater modicum of care, especially while you’re camping. Want a heavy duty cooler that’s easy to carry? This 100 quart cooler will take care of all your needs, including those who hunt and want to keep a large amount of meat cold. If you want a good idea just how much space this cooler has, it can hold up to 160 cans of drink, so that’s nothing to laugh at. It brags that it can keep ice cold for up to five days, even in temperatures of 90 degrees Fahrenheit, and sports four cup holders on the lid so that you can keep your drinks safe. It’s leak proof and has a drain channel that doesn’t require any tilting. And if you think this cooler is just too bulky, it comes with two wheels and a large handle so you can tout this big boy behind you to and from your vehicle. For the size and easy portability, this cooler is definitely worth more than its price tag. Always keep the Food and Drug Administration food safety guidelines in mind when you’re considering whether you should eat the food that has been in your cooler for a while. Foods such as meat, cheese, eggs, and milk should be stored at or below 40 degrees Fahrenheit. If they have been at room temperature for at least two hours or for an hour in ambient temperature higher than 90 degrees Fahrenheit, then it would be better for your health if you threw it out. Don’t think these kinds of food are still good because there’s no bacteria growing on them; the pathogenic bacteria has started developing long before the spoilage bacteria has started to grow. 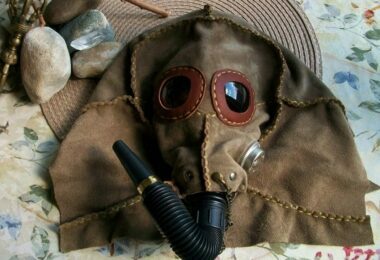 Getting sick during your camping trip, when you’re far from civilization, is not the best way to spend your vacation. Check out our tips on how to pack the basics when camping to ensure good times for you and your family.